She had five Grand Slam singles titles to her name when she first retired in 2003. 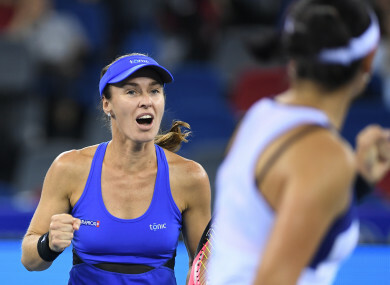 TENNIS GREAT MARTINA Hingis announced her retirement on Thursday, signalling the end of a career which took her from 1990s teenage superstar to doubles world number one some 20 years later. The 37-year-old “Swiss Miss” has retired twice before — once after testing positive for a metabolite of cocaine — but she said the ongoing WTA Finals in Singapore will be her last tournament. “Here we are for the third, and final time,” Hingis posted on Facebook, after her 6-3, 6-2 doubles win alongside Chan Yung-Jan over Anna-Lena Groenefeld and Kveta Peschke. “Looking back now, it’s hard to believe that almost exactly 23 years ago I made my professional debut. Slovakian-born Hingis took the tennis world by storm when she won her first three major titles, the Australian Open, Wimbledon and US Open, in 1997 at the age of just 16, opening a period of dominance. She had five Grand Slam singles titles to her name when she first retired in 2003 aged just 22 because of injuries, before returning to the sport two years later. Hingis’s comeback was short-lived and she stepped away from the sport again after failing a drugs test at Wimbledon in 2007. But she has enjoyed considerable success since her reincarnation as a doubles specialist, and ends her career at the top of the rankings and with 20 major titles in doubles and mixed doubles. She could still end her career on a high in Singapore, with a semi-final in prospect against Timea Babos and Andrea Hlavackova. Email “Tennis great Martina Hingis retires for third time with over 20 titles”. Feedback on “Tennis great Martina Hingis retires for third time with over 20 titles”.